"Itai Almog, pictured second from left, was the guy who led the development effort on the engineering side. He works just down the hall from me. In addition its scientific smarts, the keyboard is also packed full of time-saving shortcuts." 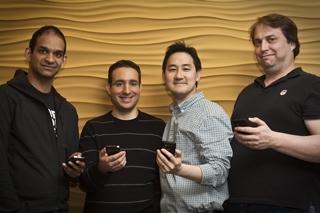 Itai, one of the engineers of the Windows Phone 7 keyboard, has listed his top seven favorite keyboard tips in a blog post on the Windows Team Blog by Michael Stroh. 1. Type fast and trust the keyboard to correct you. 2. Double-tap Space at the end of a sentence to add a period and capitalize the start of the next sentence. 3. Tap & hold various keys to reveal hidden menus. The period key is especially handy. 4. Boost your speed: Tap the Shift or Numbers/Symbols key, slide your finger to the character you want, and then release. Saves you a tap. 5. In the suggestion bar, tap "+" to teach the phone a new word. 6. To undo auto-correction: tap the word, then tap the first candidate (the original word) in the suggestion bar. 7. Multilingual? Go to Settings>Keyboard to select other keyboard languages. I assume that everyone knows that these keyboard "tips" are identical to the apple ios keyboard hidden options? Wonder if MS licensed them in a move to end up with a "standard" input interface. fwiw, trasitioning to the iOS keyboard from windows mobile was one of the hardest parts of the move. I sincerely miss features such as "slide to uppercase" and similar. also, fwiw, one of the biggest OSK "ahha's" was the realization that the os does not respond to a "tap" but rather responds to the action of ending contact with the touch screen... hence, the apple iOS "slide" options. first, these options change with keyboard presentations... for example, some iOS keyboards contain "@" and ".com" on the main keyboard depending on the input context. Related to this, for example, period/slide does not always include things such as ".com"
The tap/release action applies to some other actions... one big example, the shutter button on the iOS devices does not take the picture... releasing the "tap" triggers the shutter... makes a big difference when setting up a shot.